Don’t we just love our sports in Australia? We’re passionate about the teams we follow. Grown men are known to cry over a lost game and small children look to their favourite sporting stars as heroes. My boys follow AFL and are dedicated Bombers supporters. I’ve never seen the boys so knowledgeable about a single topic in their lives. They know the players, the game stats, they collect the footy cards and during the winter months they forget all about the TV and spend their waking hours playing at the local school oval or in my hallway if it’s too wet to be out. Sports parties are a great active way of hosting a birthday party and if you’re lucky Dad, Grandpa or Uncle might help with running the activities. When my eldest had a soccer party the only decorations I put up were some balloons at the park, mainly because the grass and wide open spaces set the scene for you and you don’t really need anything else! At our sports party we did fruit skewers which the kids loved. Watermelon, grapes, melon, strawberries and pineapple which was colourful, easy to eat and best of all healthy! Sausage sizzles are also a quick and easy catering option at a park, which won’t break the bank either. Make sure you remember to bring lots of drinks, juice boxes or bottles of water and have them available throughout the party for your thirsty sports stars. The sky is the limit when it comes to options for entertaining kids outside at a sports party. We took our sports box from home which is where we keep ALL our sporting equipment. We had cricket sets, tennis rackets, soccer balls, footballs, grip ball sets (remember those!) and we took our little portable soccer goals with us too. We laid them all out and let the kids pick what they wanted to play with. It was really nice watching parents join in and play with their kids as well. It was BY FAR the simplest and least expensive party I’ve ever run and my son still talks about his soccer party as one of his favourites. If you want to run organised games, try things like poison ball and tunnel ball. Older kids (8+) really enjoy splitting into two teams and just kicking a footy back and forth. To be honest, my husband still does this with his mates when they play footy! Here is my favourite boys cake… bake a round cake and spread green icing over the whole thing. Cover the top with green coloured coconut and use chocolate biscuit sticks around the outside to look like a fence, and presto … you have a sporting field! You can adapt this ground to suit whatever sport the birthday child likes. I’ve done this cake twice in our family (once as a soccer field and once as a cricket ground) and it looked great both times. And it takes less than 30 mins to decorate! 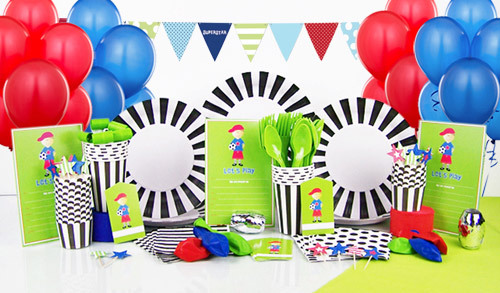 With 3 young children, I find party planning can be time-consuming and stressful. But Party In The Box makes it so easy! Just one box takes care of all the little things, and all I need to think about is the fun stuff like the birthday cake and games!